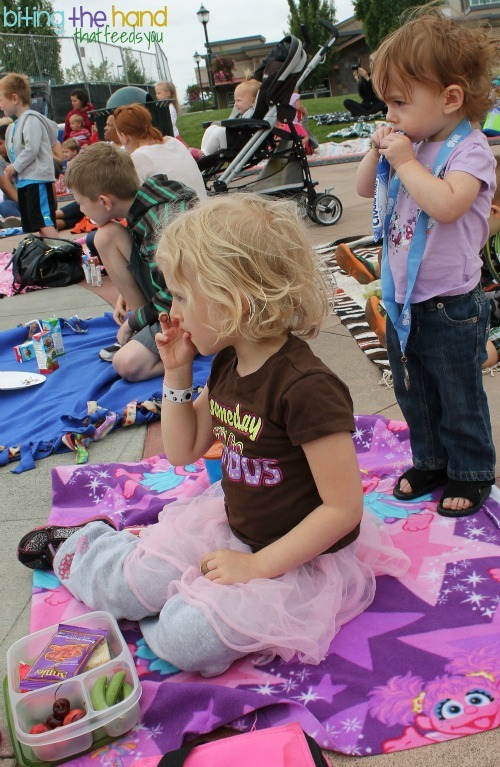 Wednesday, 7/10/13 - Our city Parks Department does a summer concert series with kiddie bands and attractions each week for roughly 6 weeks. 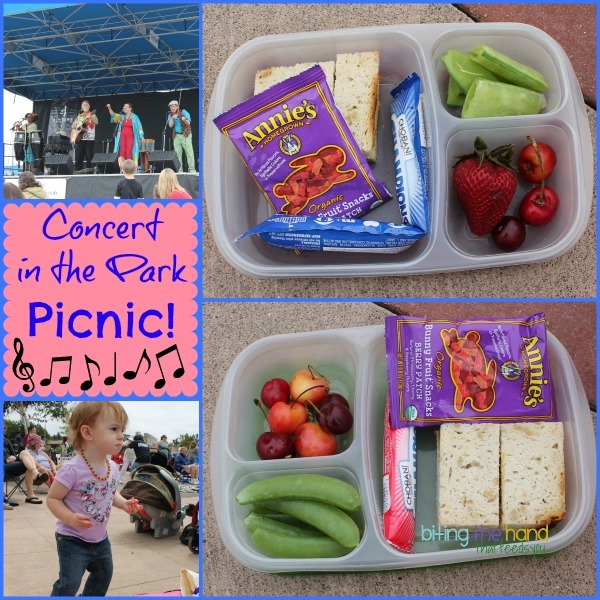 We were only able to make it to a few this summer, due to timing issues with summer camps, but I made sure to pack us picnic lunches when we did get to go! We were watching a band called Tickle Tune Typhoon. They have some great music, but are a little more hippie-feel good-Earth child than I usually go for. But they have dancers and lots of fun costumes, and lots of audience participation. Very fun for the kids. If you have "normal" kids, like everyone else. Mine just kind of sit there like zombies (kind of like when other kids watch TV!) and yell at me to stop singing or swaying to the music. 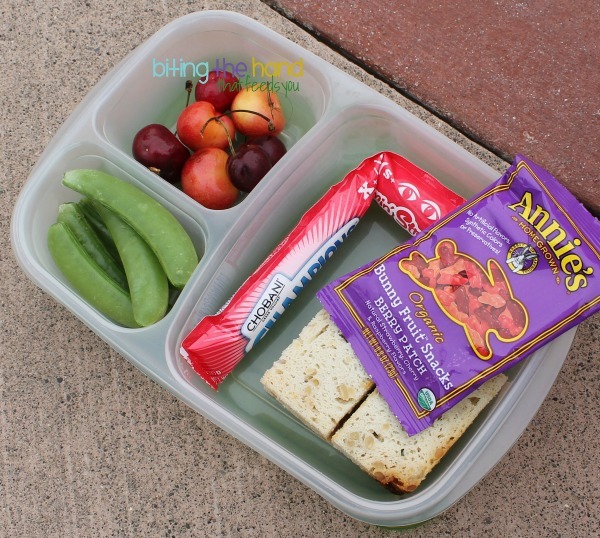 Both girls had very similar lunches, which I hardly ever do, due to different tastes, not enough of any one leftover, or just because I get bored easily. Little E's sandwich was cut into thinner "fingers" because she is more likely to eat the bread if her sandwiches are too small to just lick off. And at this time, she was the only one willing to eat the pea pods, so I gave her the freaky big ones with tiny peas inside. Sitting right next to us was a mom and her two boys. They had brought their own picnic - Lunchables. I couldn't resist snapping a pic to show that even these "Mamamamamamama pleeeeeeeease?" products aren't all that appealing once you open them up! My girls were able to work on the rest of their lunch some more later, on the way home and as an afternoon snack. 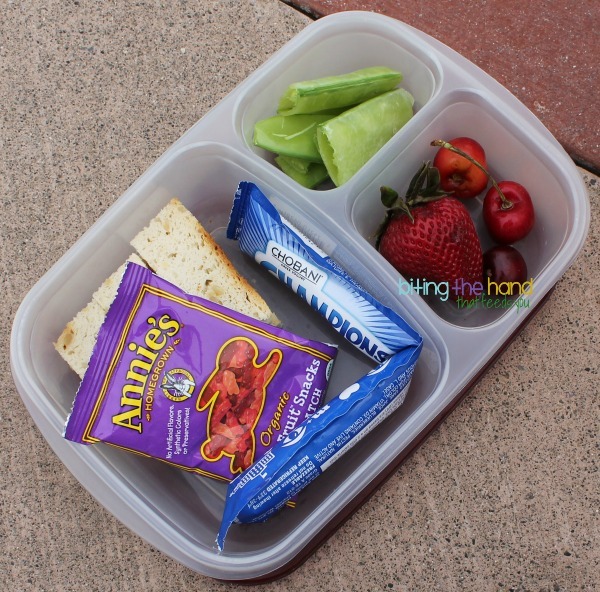 It's hard to salvage the leftovers in the disposable lunches, since you can't seal them back up. And you probably wouldn't have an ice pack handy, to keep them fresh if needed. And even with the fruit snack and yogurt tube wrappers, we still had less waste than 90% of the people who'd brought a lunch there! 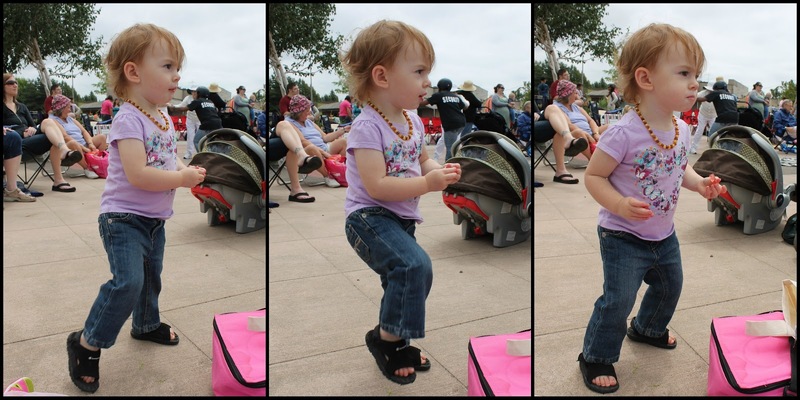 E finally did get up and dance near the end, which was stinkin' adorable! She's a crappy dancer, just like her Mama! I love the posting! I too have sorta done a comparison of my lunches to other lunches I see around. I think my daughter has started doing it too! Just yesterday we were talking about the lunches the other kids at school had and she was talking about how some had no veggies or fruit and some were pretty good but ''not as good as hers''. 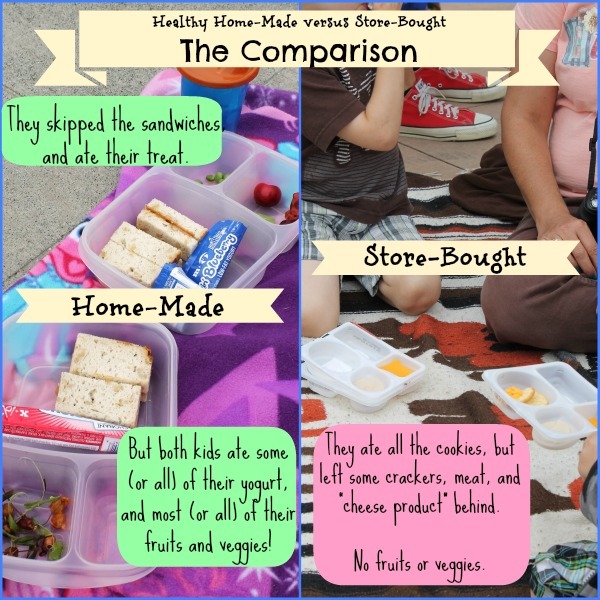 We use the my plate image to talk about all the different elements that go into her lunches (grains, fruits, veggies, protein, dairy) so she notices when other kids are missing parts. There was a ''nacho'' lunchable yesterday that Monkey said looked good but knew was bad. Which was just chips, cheese product, salsa, capri sun, and a piece of candy. I know I could make her a homemade version that will be much better for her and make her feel like she's getting those same treats as her classmates. :) Good on you for getting your girls into healthier eating habits than their peers. Sorry you feel that way. I certainly wasn't trying to be. My point was more that while kids beg and clamor for these, in the end, they aren't all that appealing. Plus you can't really even save the leftovers for later. And they aren't even remotely close to a balanced meal. I will always, however, be judgmental about fake cheese and unhealthy products. But not for parents feeding them to their kids. We've eaten many a Lunchable. No, I despise the companies who make them, implying that because they contain some dairy or some whole grains or heavily sweetened fruit that they're a healthy option. Oh brother... you weren't being judgmental of the family at all. You were merely making a very valid comparison of packing your own fresh lunch and packing one that is full of fake products and preservatives. And I agree with you about them not being as appealing to kids once they actually experience them; as a kid we rarely had Lunchables, but we did sometimes have tv dinners and I remember begging my mom for those Kid Cuisine ones, you know? And they were never as good as they looked on the box, and being older now I look at what's in them and I'm disgusted I ate them!